Rooster Fin games are easy to learn, easy to play. Geared for ages 8+ these games are great fun for the whole family. We had the opportunity to play Shufflin' Feet with the kids! 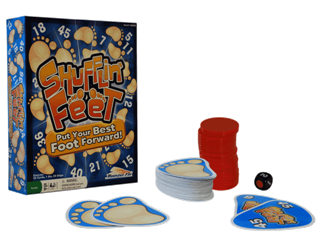 "Shufflin’ Feet™ is the funny game that takes unexpected twists on every turn! The players compete to win chips by playing higher valued cards than their opponents. But on every roll of the cube, a player’s card can suddenly slide away to another opponent. Quick wits and a little luck can leave any player in position to win on any turn. It depends on which direction the feet shuffle!" There was some strategy to be learned but once the younger ones caught on to it, it was a pretty balanced game. Not too intense for the small ones. Fast paced, and fun to play! 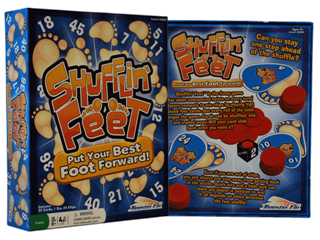 Enter to win a copy of Shufflin' Feet for your next game night! Use the Rafflecopter for entries. USA only. Ends Aug 13. Monkeys Up looks like fun! Monkeys Up looks really cute. Color Slap and Masheroo look neat. Color Slap. Thanks for the giveaway.